As most of you know, I am a goddess devotee and love nothing more than exploring the archetypal qualities of the goddesses from every culture and corner of the world. Why? Because in our patriarchal society, we are lacking models of the divine feminine and because it helps us understand ourselves as women when we look at the stories and attributes of the various goddesses throughout time. I probably don't have to tell you that we women are complex creatures and carry a lot of magic and mystery within our very bodies and souls. For example, we carry the archetypal qualities of birth, death, regeneration, transformation, receptivity, nurturance, wisdom and love. And getting to know and understand the myriad goddess archetypes, each with their own singular set of attributes and patterns of behavior, we begin to comprehend the multi-dimensional nature of the feminine and what it means to be spiritual beings on a human path as much as human beings on a spiritual path. It all started for me with a love of stories, particularly myths, folk and fairy tales, which began, as for most of us, in early childhood. I eventually started realizing that the fairy tales derived from the ancient myths. 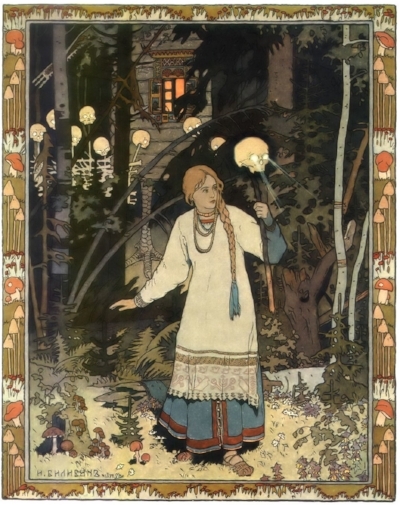 For example, the Russian fairy tale, "Vasilisa, the Brave," about a little girl who goes into the forest to meet the witch, Baba Yaga, who gives her three tasks to perform to earn her stripes bears many similarities to the Greek myth of "Psyche and Cupid." The mortal girl Psyche must win the right to become a goddess and marry the god of love by performing three tasks set by Cupid's mother, Aphrodite, the goddess of love and beauty. And Snow White could sub for Psyche and Aphrodite for the wicked Queen who is jealous of Snow White's beauty. Reading these tales of mischief-making and derring-do thrilled and enthralled me. Here were brave girls performing acts of courage and heroism using their wits and cunning. The ancient myths provided examples of women of wisdom and power who often challenged other women and goddesses to rise to the occasion of their full being, to use the unique gifts bestowed upon them, and to lead with confidence once they had met the challenges before them. I have discovered the joy of getting to know the particular stories and qualities of the goddesses, which has led me to teaching other women through my Goddess Temple e-courses how to use these archetypes to better understand themselves as mortal women and to see the goddess within. I have shelves of books about goddesses and one of my favorite and oft-used, go-to references is the Encyclopedia of Goddesses & Heroines by Patricia Monaghan, Ph.D, which was first published in 1981 and has gone through several editions. So imagine my delight when I was asked to review the latest revised edition, published by New World Library, released this year. It has a beautiful cover image by Tracy Cunningham of a red-haired maiden in the mode of John Waterhouse, which deliciously invites you to open the pages and behold the array of goddesses to be found around the world. In a helpful departure from the original edition, over 1,000 goddesses are categorized by continents and countries, and alphabetized within each geographical section. Each section contains an Introduction, which gives you an overview of that particular culture and its history of goddess worship, beginning with the African pantheon, followed by Eastern Mediterranean, Asia and Oceania, Europe, and the Americas. The European pantheon is the most prolific and detailed, covering The Baltic, The Celtic World, Finno-Ugric Cultures, Greece, Rome, Scandinavia, Southeastern Europe, and the Slavic Peoples. The Asia and Oceania section is next in size with six sub-categories including China and Korea, Circumpolar North, India, Southeast Asia and Indonesia, Japan and The Pacific Islands and Australia. These are even further divided into sections such as "Hindu and Buddhist Pantheon of India, Nepal and Tibet." In this book you will find well-known and beloved goddesses as well as little-known and obscure goddesses, such as Vac, the Hindu Goddess of eloquence and abundance and inventor of the Sanskrit language. We learn that she is a form of Sarasvati, the more familiar Hindu goddess of the sacred arts and sciences, who is usually depicted holding the book of knowledge, a musical instrument called the veena, and a rosary. As described in the Introduction to the book, goddesses come in many forms and represent many different aspects of the feminine. For example, "Goddesses can appear as young nymphs, self-reliant workers, aged sages. They can be athletes or huntresses, dancers or acrobats, herbalists or midwives. We find goddesses as teachers, inventors, bartenders, potters, surfers, magicians, warriors and queens. Virtually any social role women have played or are capable of playing appears in a goddess myth." That's what I love about this compendium. You really get to see the full gamut of human expression and behavior embodied in these supernatural archetypes. Some goddesses are summarized in a paragraph while others are given a page or more, depending upon the breadth of knowledge and available record of these feminine deities. There is an extensive index in the back of the book that helps you locate individual goddesses by name as well as categories of goddesses, such as fire goddesses, grain goddesses, household goddesses, mermaids, etc. The bibliography is replete with primary textual, as well as oral, and other sources of the legend and lore provided in the book. This edition makes cross-referencing easy as goddess's names, whenever mentioned even within the context of another goddess's description, are in bold print. I find this encyclopedia to be much more user-friendly and easy to access than the previous one. Patricia Monaghan, who died in 2012, was a feminist scholar, poet and author, who wrote over 20 books on goddess and earth-centered spirituality, as well as books that explored her Irish roots and extensive knowledge of Celtic mythology. There are few reference books on goddesses around the world, and Patricia Monaghan's Encyclopedia of Goddesses and Heroines is a must-have resource for lovers of goddesses, their history and lore, as well as for those who seek to understand and write about feminine spirituality and archetypes. Click here to take a self-study course on 4 goddesses, Brigid, Inanna, Artemis/Diana, and Cerridwyn, in the New Moon Goddess Mystery School.